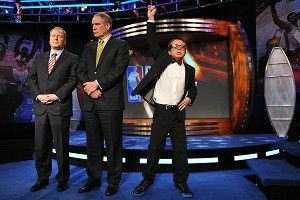 There’s nothing all that visually spectacular about this, the 2008 NBA Draft Lottery, aside from the deadpan presence of then-new Nets co-owner Jay-Z. But I always like these slices of history, where you get to go back and see a moment that actually changes everything, unbeknownst to most involved. Kevin Durant clearly does not know how to react to the news that the Seattle SuperSonics got the fourth overall pick. This pick could have been Joe Alexander (currently getting that BC Krasnye Krylya money in Russia), it could have been Kevin Love (that would have been interesting). Instead it was Russell Westbrook. In which the Boston Celtics miss out on the Durant-Oden sweepstakes and Wyc Grousbeck stares a hole into the back of the universe. My favorite part of this clip is the line “The Timberwolves saying Kevin Garnett will not be traded. Where will help come from?” as the camera lingers on Randy Foye. This, of course, would begin one hell of a summer for the Celtics; they would acquire Ray Allen from the Sonics and, yes, the T-Wolves traded Garnett. Wyc would be smiling soon enough. This is the Orlando Magic’s Pat Williams reacting to winning the 1993 Lottery. (The Magic wound up drafting Chris Webber and trading him to the Warriors for Penny Hardaway.) He also won the Lottery in 1992 (Shaq) and as part of the Sixers organization in 1986. Seriously, how much would it cost to take Pat Williams to Vegas and just make him stand by your craps table?